The four panels represent roughly the different steps in the formation and disassembly of focal adhesions. The lamellipodium is distinguished from the lamellum by a color difference; the actin filaments represent the retrograde flow and the blue arrows indicate its characteristic centripetal flow. 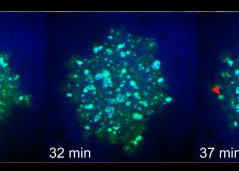 From left: Panel 1 shows formation of nascent adhesions at the cell periphery. In panel 2, some adhesions attach to stress fibers and grow in size while some disassemble (yellow with dotted outline) at the lamellipodium-lamellum boundary. Maturation happens upon increase in tension along the stress fibers (panel 3). The protrusions of the cell edge are shown as green arrows corresponding to points of adhesion maturation (panels 3 and 4). Panel 4 shows sliding of adhesion and hence slight retraction of the respective section of the cell edge compared to panel 3. Decrease in retrograde flow at points of adhesions is marked by the dipping of the lamellipodial border. Adapted from [4, 8]. Focal adhesions act as molecular clutches that provide grip to the substrate for the lamellipodium to protrude forward during motility. Their formation is highly dependent on the lamellipodial actin flow . Focal adhesion formation is initiated by receptor-matrix binding along the cell periphery at the leading edge. These early complexes, hitherto referred as “nascent adhesions”, initially attach to actin filaments via adaptor proteins such as talin . At the lamellipodium-lamellum interface, unstable adhesions disappear and stable ones start to elongate in a centripetal fashion along the direction of actin retrograde flow. 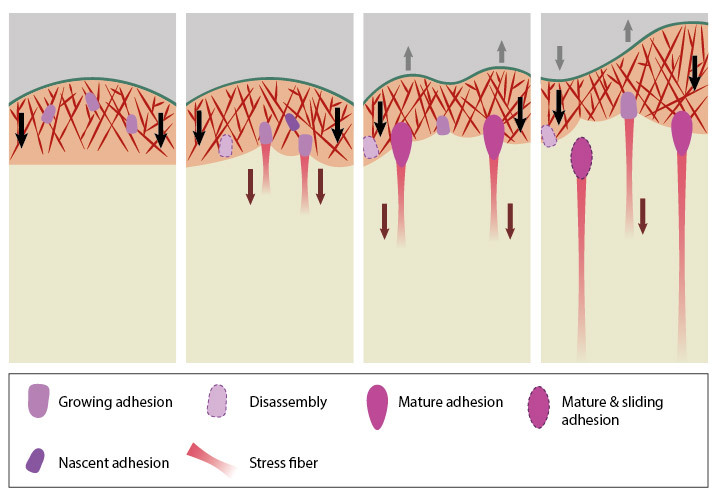 Growing adhesions increase the traction on the substrate, slow down the actin retrograde flow , aid force transduction along the attached actin bundles and in turn, reinforce the linkage to actin by recruitment of additional scaffolding and signaling components  (reviewed in ). Further, traction forces exerted by actomyosin contractions and resulting signal transduction events such as phosphorylation of components by focal adhesion kinase promote adhesion maturation (reviewed in ) and the formation of stress fibers in the lamellum (reviewed in ). Finally, the disassembly of focal adhesions occur by a number of mechanisms. At the border of lamellipodium and lamellum, focal adhesions disassemble through the dispersal of adhesion components, whereas at the rear they disassemble by inward sliding . During the transition from nascent to mature adhesions, the morphology of the focal adhesion changes from a symmetric diffraction-limited spot to that of a polar, elongated formation with a distal tip (‘toe’) and a proximal end (‘heel’) (reviewed in ). Newly formed actin bundles grow from the heel of mature focal adhesions. The proteins that participate in and the series of events that lead to this dynamic reorganization are still unclear. It should to be noted that, reinforcement of the adhesion structure happens alongside assembly as and when particular components get recruited and is not restricted to any particular stage. Similarly, signaling transduction also happens throughout the life-cycle of adhesions. Since focal adhesion growth correlates with cell movement relative to the substrate, focal adhesions appear to move from the periphery to the cell center as they grow . At each stage they undergo turnover after a certain time period (reviewed in ). Within a particular adhesion, the bond strengths between ligand-receptor-cytoskeleton are preferentially stable at the leading edge and weaken towards the rear, where disassembly happens . 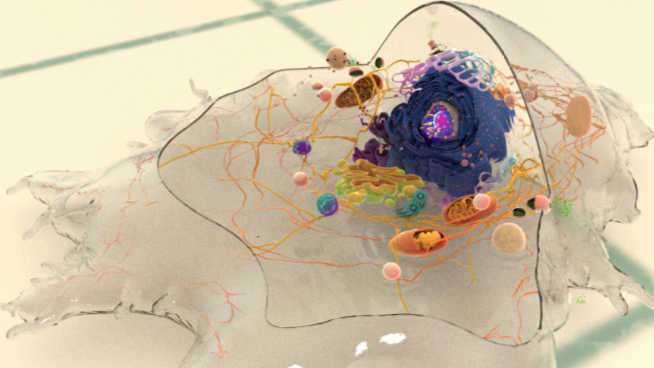 Earlier adhesions exert high propulsive forces which aid cell migration. This decreases at later stages such that upon maturation, the adhesions effectively act as passive anchorage points . Also, nascent adhesions are mostly non-motile while late adhesions can reorient themselves in response to forces experienced .